Centrally located in the heart of New Orleans you can experience this beautiful, private studio and grounds. 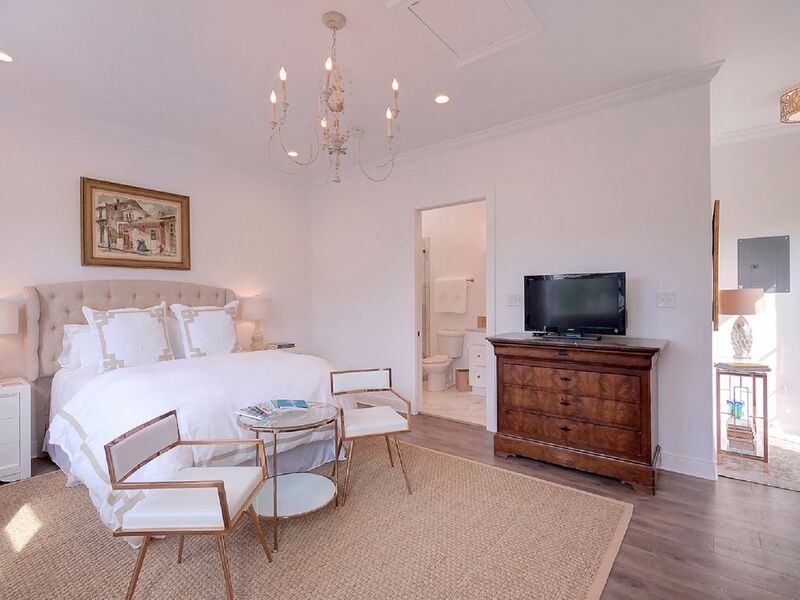 Newly constructed with upscale materials, this studio features upscale finishes including quartzite kitchen & bath counters, Carrara marble shower, and designer lighting, linens and furnishings. Only a 10 minute Uber or Lyft ride from all of the world class attractions, restaurants, and bars. Every element of this space was chosen with luxury in mind. Quartzite countertops, Carrara marble in the bath, Champagne bronze plumbing fixtures. Bedding is 100% cotton 400TC Italian sheets, with a Peacock Alley coverlet and shams and Suzanne Kastler for Ballard Designs linen and cotton Duvet and Euro shams. Ralph Lauren towels. Appliances include a full size washer & dryer, refrigerator with ice maker, microwave drawer, dishwasher, coffee maker and toaster oven. The city is known for its distinct French and Spanish Creole architecture, as well as its cross-cultural and multilingual heritage. New Orleans is famous for its cuisine, music (particularly as the birthplace of jazz) and its annual celebrations and festivals, most notably Mardi Gras. The city is often referred to as the "most unique" in the United States. Immerse yourself in serene luxury the moment you step though the backyard door. Every element of the studio and pool area was chosen with luxury & comfort in mind. Quartzite countertops, Carrara marble in the bath, Champagne bronze plumbing fixtures. Bedding is 100% cotton 400TC Italian sheets, with a Peacock Alley coverlet and shams and Suzanne Kastler for Ballard Designs linen and cotton Duvet and Euro shams. Ralph Lauren towels. Appliances include a full size washer & dryer, refrigerator with ice maker, microwave drawer, dishwasher, coffee maker and toaster oven. Use of the pool and pool area is included with rental of the studio, weather permitting. Quartzite countertop, Carrara marble floors & shower. Ralph Lauren towels. Access to studio requires using the stairs. Pool only shared with owners. Pool may be shared with the owners. Luxury rental. Everything is extremely high quality. The owners are very nice and more than accommodating for requests. I have already recommended to my friends and family, would stay here again in a heartbeat! Very nice section of town, easy access to downtown/French quarter, if you are in NOLA then this is the place to stay. Had everything we needed for our 3-night stay. Quiet area but easy to get to everything. Clean and comfortable. Wish it was warmer so we could have enjoyed the pool ... maybe next time! The Poche's Pool House could not have been any more perfect for my two night stay. After attending a work conference in downtown New Orleans, I wanted to stay 2 more nights to take more of the city in being a first-timer. The house is just as pictured with a fabulous pool area with artificial grass to make it lush and gorgeous. Being alone, I can say I felt incredibly safe both in the home and in the area that it sits in. Within walking distance is a wonderful, little street with fabulous restaurants and little shops. There really is so much to explore and do in New Orleans. I intend to come back and when I do I will be staying here again. I highly recommend!! We had a great experience in the Pool House - easy access, well equipped, and very clean, Location was perfect as a respite from the hustle and bustle of the quarter and down town. No worry about parking and would definitely stay again. My husband and I spent the week of our wedding in this beautiful pool house. So happy we picked this place over a hotel. I'm from New Orleans and have to say this place is better than hotels in the New Orleans area. Very comfortable and beautifully decorated. Perfect amount of space and has everything you need. Don't pass it up!